Beaconhills College recently engaged InSight Systems to upgrade the existing infrastructure in the auditorium at the Pakenham campus. The project involved upgrading the video switching system, integrating a foldback monitor and replacing the existing side-of-stage video walls. InSight Systems were asked to design a system that allowed connectivity from a large number of devices including an upgrade to accept iPad and iOS inputs. 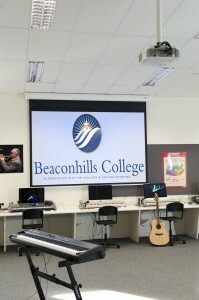 To improve the professionalism of performances at Beaconhills College, video is sourced and distributed between the orchestra room, the black box theatre, side-of-stage and on stage. This content is distributed and displayed throughout the different spaces, including two massive video walls on either side of the stage. This allows the orchestra to warm up in a separate room whilst viewing the current performance on a projector, or performers in another act can warm up and rehearse in the black box theatre whilst viewing the live performance on a screen. The video distribution also allows content from either of these rooms to be displayed to the audience on the video walls either side of the stage. Video walls using NEC 55” panels in a 2 x 2 format were installed on either side of the stage to enhance the viewer’s experience and interaction with theatre productions. A Blackmagic HyperDeck Studio was installed to capture, store and distribute video content. The HyperDeck Studio feature dual 2.5” solid-state disks (SSD) allowing seamless recording across slots, meaning Beaconhills College will never miss a thing. 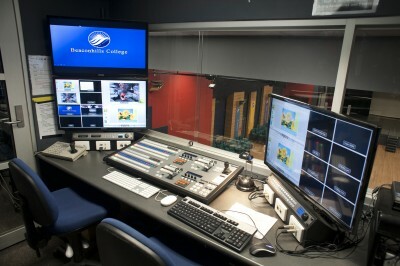 The included HyperDeck software allows the recorded SSDs to be accessed from any computer eliminating the need for multiple pieces of hardware and giving Beaconhills College a great amount of flexibility with the final recording of the performance.